Thank you for your past support and membership! It is generous donations from you that make our work possible! Please renew your membership today by clicking here! Thank you for your past support for Save The Colorado! The last 12 months have been pivotal in our work to protect the Colorado River. We’ve made FRONT PAGE NEWS several times and put the entire Colorado River basin on notice that when we say, “NO NEW DAMS AND DIVERSIONS”, we mean business! First, in Colorado, our work to stop the proposed “Windy Gap Firming Project” is going well. 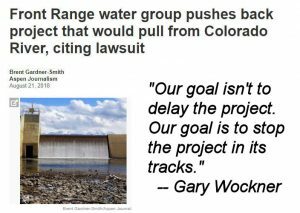 Along with 5 co-plaintiffs, we led and filed the lawsuit in October of 2017 against the project, and since then the applicant has officially “delayed” the project pending the lawsuit proceedings. The project would be the first new consequential dam and diversion in the Colorado River system in the last 40 years proposing to drain a new ~9 billion gallons of water directly out of the Upper Colorado River every year. 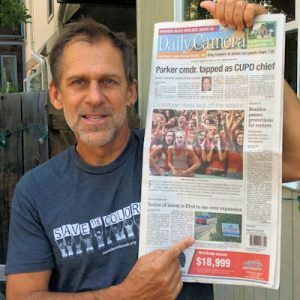 Our work was highlighted in several newspapers when we filed the lawsuit, and well as when the project was delayed. The final court decision may not come for another 12 months, but this is a temporary victory that put the entire Colorado River basin dam-building proponents on notice. Your support helped make this happen. Second, also in Colorado, we are fully geared up to fight the Moffat Collection System Project – the Gross Dam expansion in Boulder County, Colorado. In September, we filed a “60 day notice of intent to sue” under the Endangered Species Act, and we are preparing to challenge the project very soon. 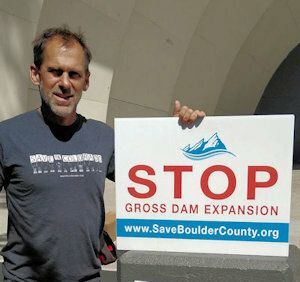 The proposed dam would be the tallest in the history of Colorado while further draining the Upper Colorado River and its small mountain tributaries. Your support will make this happen. Third, also in Colorado, we’ve put the State on notice that a proposed massive new dam on the White River near Meeker will face a fierce headwind. We are also tracking several other proposed dam and pipeline projects in various parts of the state that may move forward to a permitting process in the near future. 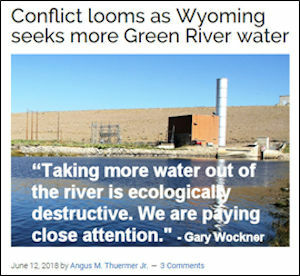 Fourth, in Wyoming, we’ve led the resistance against the proposed massive expansion of the Fontenelle Dam and Reservoir which would be the biggest new diversion of water out of the Green River which flows into the Colorado River. The permitting agencies are on notice that there’ll be a fight ahead if Wyoming applies for a permit. We also led the fight in Wyoming against the proposed 280-foot tall dam on the West Fork of Battle Creek, a tributary to the Yampa River. The State of Wyoming has now delayed the project and we are unsure when they will push forward with a permit application. Fifth, In Utah, we continue to lock arms with colleagues against the Lake Powell Pipeline, a large proposed diversion directly out of the Colorado River. We just got some good news from the Federal Energy Regulatory Commission which notified the State of Utah that the project would likely require a full Environmental Impact Statement review from another agency, in addition to FERC’s hydropower license. This decision may stall the project for years and help us fight to stop it. Finally, our long-term goal of draining Lake Powell and tearing down Glen Canyon Dam continues to gain traction. 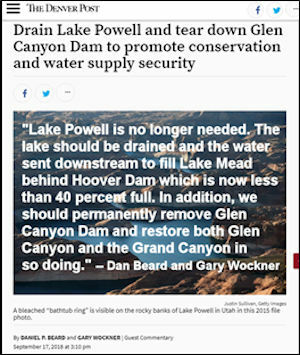 Scientists and the media have all started pushing the idea forward, and in September of 2018, Dan Beard and I published an op-ed in the Denver Post titled, “Drain Lake Powell and Tear Down Glen Canyon Dam to Promote Conservation and Water Supply Security”. We also continue to investigate legal opportunities to push the federal agencies in our direction.